Vic Law seeks to block a Michigan State shot. The Wildcats and Spartans played a wild game Saturday. It was about to happen — until it didn’t. Northwestern nearly pulled off what would have been one of the biggest upsets in program history in a 65-60 loss to No. 2 Michigan State on Saturday. The Wildcats (15-13, 6-9 Big Ten) built a 27-point lead on the Spartans (26-3, 14-2) with just over four minutes left in the first half, but foul trouble and out-of-sync offensive possessions led to a second-half collapse. In the first half, NU had one of its best shooting halves of the season, going 60 percent from the field against one of the best defenses in the country. Junior forward Vic Law filled the hole in the offense vacated by an injured Bryant McIntosh, scoring 18 and hitting multiple deep 3-pointers. It was the second half that doomed NU. The Cats opened the half extremely slowly, at one point missing 17 consecutive field goals. 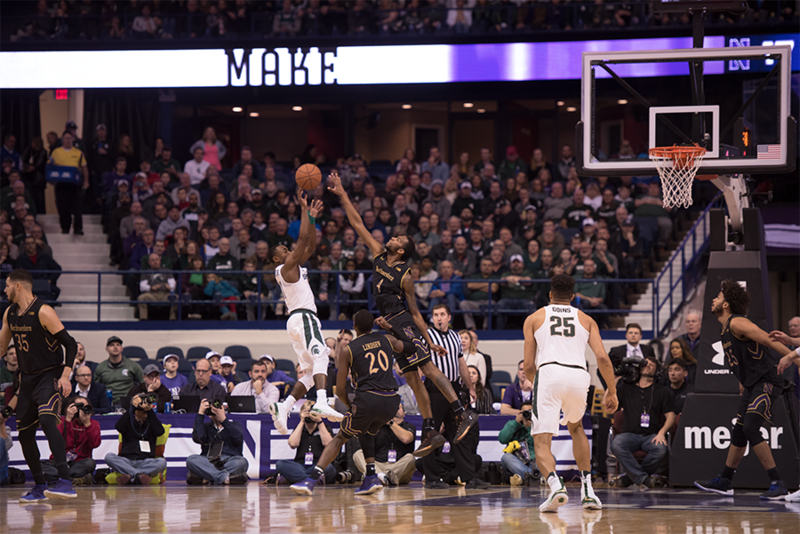 The Spartans went on a 24-0 run in the frame and held NU to just two points in eleven minutes. NU battled foul trouble that sent junior center Dererk Pardon and senior forward Gavin Skelly to the bench each with four fouls with 14 minutes to play. The Cats would score just 11 total points in the second half. Guard Cassius Winston scored 17 points to led the Spartans. Winston hit multiple key 3-pointers down the stretch to help lead the Spartans’ comeback. 1. Vic Law has star potential. The junior forward scored 21 points and stepped up to lead an offense that was missing senior guard Bryant McIntosh, tying his career-high with 5 assists. Law’s explosive performance in the first powered the Cats to build a double-digit lead, but he was unable to find his shooting rhythm and was held to just 3 points while missing seven straight shots in the second half. 2. The Cats’ second-half offense was abysmal. NU entered the second half with an 22-point lead and the momentum in their favor. That disappeared quickly, as the Cats fell into foul trouble early and missed 17 consecutive field goals as Michigan State cut the lead and went on a 24-0 run. The Cats went 11:31 without scoring, and the second half saw a return to the offensive struggles that NU has suffered this season with McIntosh on the sidelines. 3. Northwestern almost got a marquee win. While the win may not have changed their prospects of returning to the NCAA Tournament, it would have given the Cats some momentum heading into the final stretch of the season. The loss drops NU to ninth in the Big Ten standings, and the Cats will look to avoid dropping any further ahead of the conference tournament in its remaining three games of the regular season.